Here’s something that will make you, dear Braiser reader with an inclination towards politics and geeky men, love him more: he once used that massive brain of his to find the best burrito in Chicago’s Wicker Park — and he wrote a blog about it. Eater dug up The Burrito Bracket, an old Nate Silver project from 2007, where he “set up a playoff bracket of 16 taquerias, all of which are within walking/biking distance of [his] apartment. Items will be consumed on the premises; burritos can lose a lot of their gusto even from a simple 5-minute walk back to the apartment. However, the scoring will be determined almost exclusively based on the taste and quality of the food; things like service, “atmosphere” and price will only be used as tiebreakers. You don’t go to a taqueria for white-tablecloth dining. 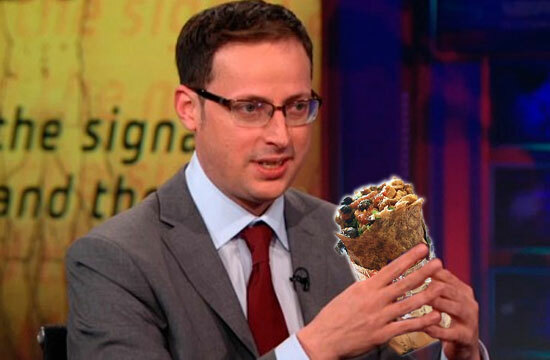 Oh, Nate Silver. This is probably the only time we have ever seen an Excel chart on a food blog. Sadly, we will never truly know what the quantitatively “best” burrito in Wicker Park, Chicago is, because he abruptly stopped posting in November of 2007 midway through the bracket, likely to start tracking polls for the 2008 election. Doubtless, though, had Silver continued with this project, he would have eventually figured a way to render the entire field of restaurant criticism obsolete.